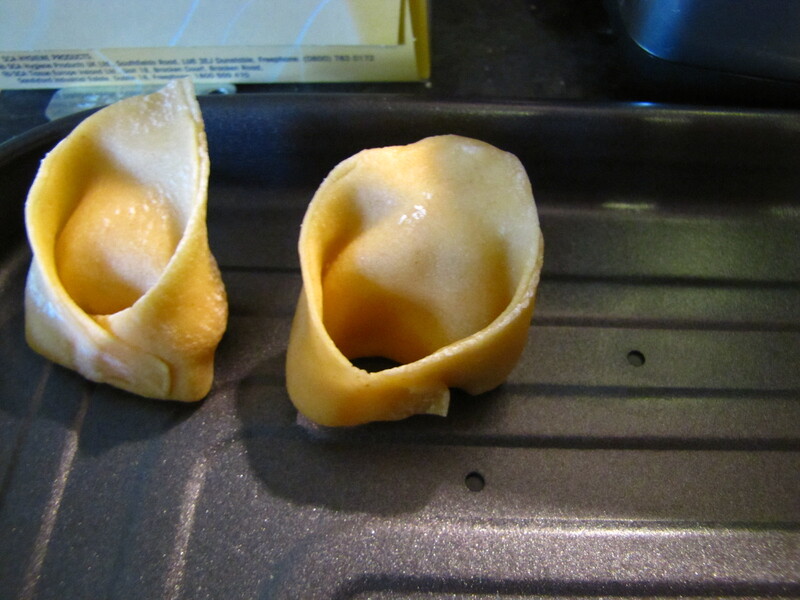 Apparently inspired by the image of Venus’s navel, Tortellini are a ring-shaped stuffed pasta. Although they can be a little time consuming to make, they are really not difficult and are well worth the effort, especially for entertaining. Tortellini look great, can be stuffed with a variety of fillings, served in a broth or a pasta sauce. What’s more, they freeze well and once you get into a rhythm can be turned out quite quickly. When it comes to size, it’s really up to you. I’ve had success with small squares of pasta 4-5cm across, but these take forever to create and don’t accept very much filling. I much prefer using 7cm squares, which is half the width if a sheet of pasta coming off my pasta roller. Need some ideas for fillings? Try these!